pampas2palms: Another plant off the lust list! I guess you all have lists of plants that you lust after. Very useful in reminding ourselves of the wonderful plants seen but which can be frustratingly difficult to source. (Incidentally Wikipedia definition - 'Lust is a powerful psychological feeling producing intense wanting' - that sure describes how we gardeners sometimes feel about certain plants!) One of my 'must have' plants for a couple of years has been Fatsia 'Annelise', a good hardy false castor oil plant but with wonderful bold golden variegation on dramatic leaves. A great hardy exotic! I had one at the University and have seen it in a few other gardens but never found it for sale. Only two nurseries list it in the Plant Finder. One nursery does not do mail order and on enquiry, the other always says "it's in propagation - try later in the season". I do wish nurseries would not list plants they can rarely supply. Anyway last weekend I was giving a talk and two of the audience, who are keen gardeners living near to me told me that a local small nursery had two plants for sale. Quite co-incidentally it was the lady from whom I had obtained the original university plant many years ago. So obvious - I should have asked her before. Anyway I dashed down there after a hasty lunch and was delighted to buy a good sized plant for £20 which now graces my front garden. I must also give you an update on a past acquisition. 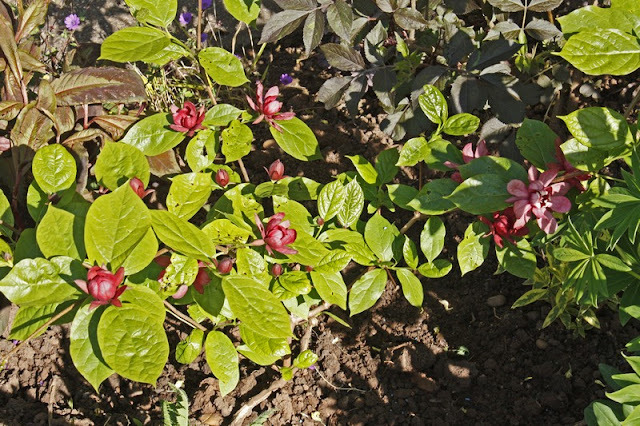 Those readers that have lasted since year may remember me blogging on the saga of Sinocalycanthus 'Hartlage Wine'. This was one of last year's desiderata and you can read about it here. Anyway the excellent plant that I eventually obtained from the Duchy Nursery came through the winter with no mishap and is now nicely flowering in the light shade in my front garden. 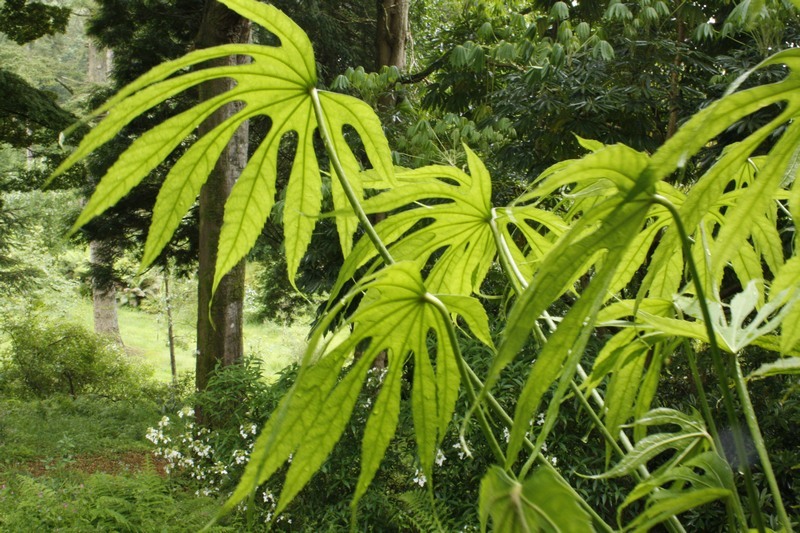 It's planted next to a Sambucus 'Pink Thundercloud' which should provide a good contrast of foliage and toning flowers if they ever bloom together. Success! Sinocalycanthus 'Hartlage Wine' - Chad tells me this should now be Calycanthus x raulstonii 'Hartlage Wine' and he's probably correct, although Hilliers still had it as Sinocalycanthus at Chelsea the other week. Trouble is, every time I cross something off the 'lust list', there's something else I need to add. 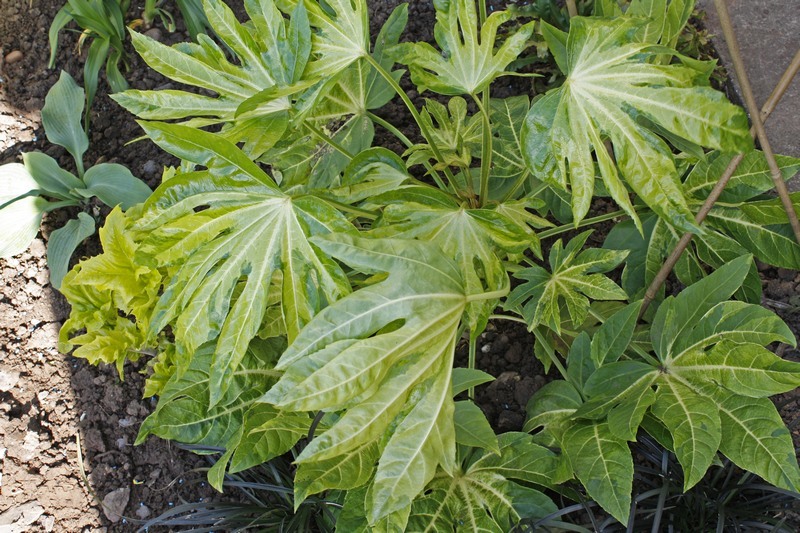 Anyone know where I can get a good form of Fatsia polycarpa? Finally you have an Annelise, a great looking plant! There's a few nurseries that we know of that sells that particular form of Fatsia polycarpa (Needham Form): Lower Keneggy, Hardy Exotics, I think Desert to Jungle stocks it now (they'll be at Hampton Court if my memory serves me right), and Panglobal Plants may have it to. Mail order wise, Hardy Exotics could be your best bet. Again, I am not a professional crawler but keep up these interesting blogs on I'd say plants that have a little wow factor. 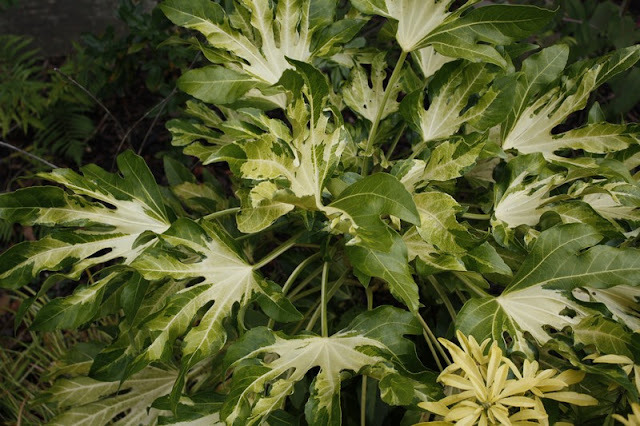 I am always amazed that many people find variegated plants horrid. For me there is nothing more rewarding than seeing a decent planted mixed border with shrubs and a few perennials and gems like F. 'Annelise'. Beats a mass Prairie Planting scheme any day and above all our dear F. 'Annelise' give us year round interest. Fantastic. Glad someone else shares my enthusiasm for variegated and coloured leaved plants! I am sure I have far too many in a small garden and would never use as many in a professional design but I love 'em!